Toronto is one of the most multi-cultural cities in the world with hundreds of languages and cultures amassing this wonderful city. A city as multicultural as Toronto means something to foodies: Amazing international food all in one spot! We wanted to taste a bit of the world and so we set out on a date day to experience what Toronto has to offer. 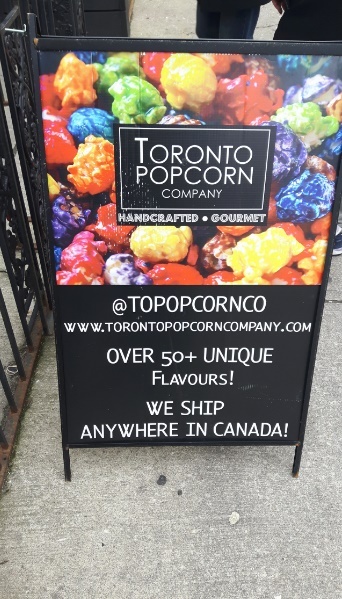 We decided to go with the best, Tasty Tours in Toronto. 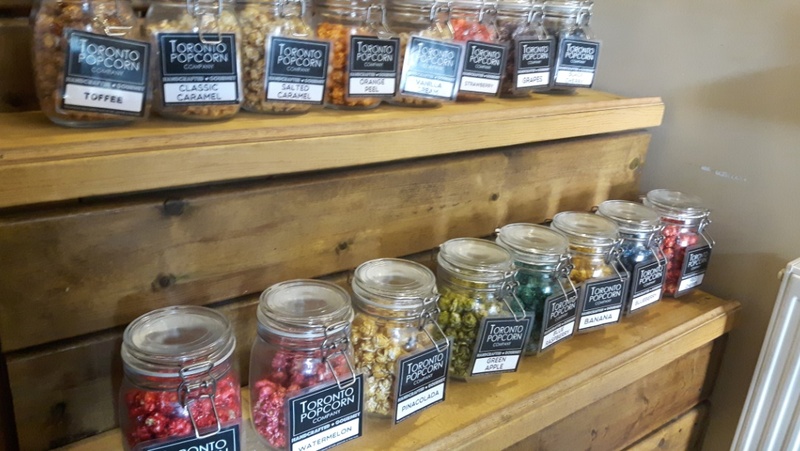 We knew that Tasty Tours provided the Sweet and Savoury Tour of Kensington Market and that we would get only the best. Tasty Tours Kensington Market Sweet and Savoury Food Tour is a great way to be introduced to multi-cultural food stores. In groups of about 10 from 11:30am-2pm, you will be immersed in culture, samples and more! This is more than enough to cover your lunch so you will walk away full and happy. 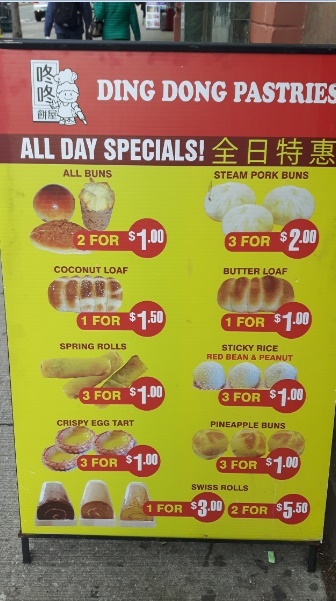 As we arrived at Ding Dong Bakery on Spadina Street in China town, we already knew we would not be disappointed. This place was busy and we met our wonderful tour guide, Audrey, at the back of Ding Dong where there were some delicious spring rolls waiting for us. We were introduced to each other as we dined on Spring Rolls. We had an excellent group. From locals in the city and neighboring towns to international visitors, we had a great group of foodies ready to discover the heart of Toronto, Kensington Market. We were excited to be on tour with Gaby from the Brazilian/Canadian blog Gaby no Canada. If you have not checked out her blog, please do so. As a Torontonian herself, Audrey brings so much to the table (other than delicious spring rolls!) 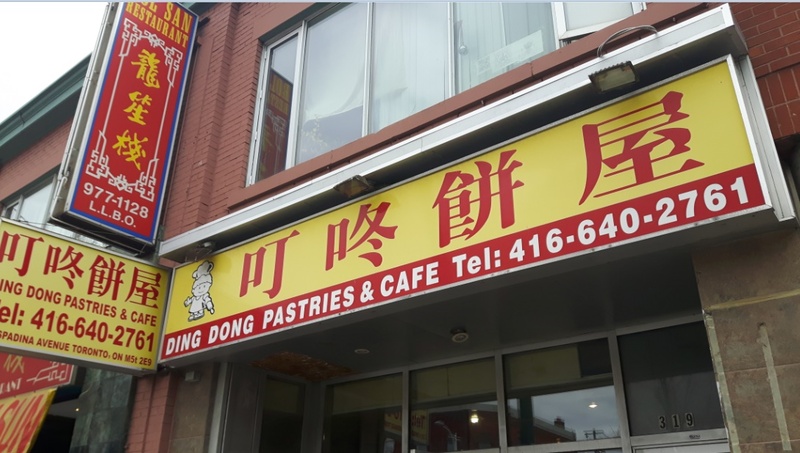 She gave us the history of Ding Dong restaurant/bakery and how one woman has taken this Spadina staple as her baby. The prices are beyond reasonable and everything is fresh. You have to come here to stock up on all of your baking needs. Want to look around? 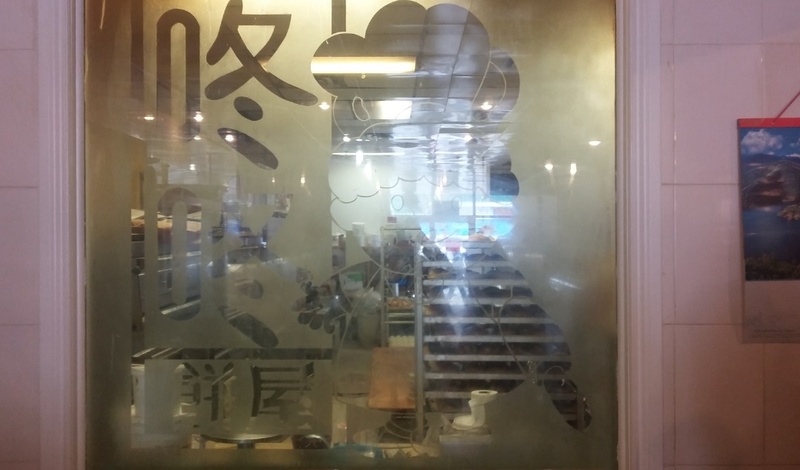 Make sure to go into the back and peek through the glass to see the employees baking your next delicious treat. 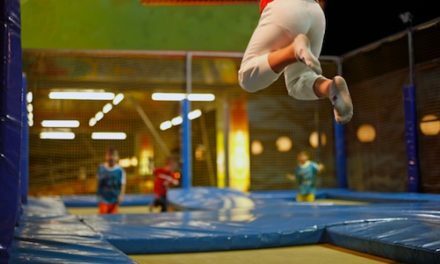 This is fun to for a date and for the children as your little ones will appreciate how good food is created and the importance of great service and fair pricing. 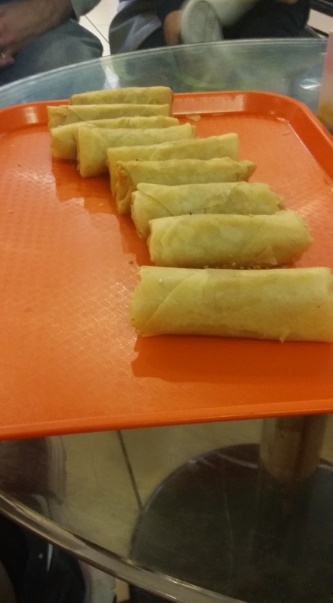 The spring roll was fresh and delicious. This staple food has a long history and kept its name for thousands of years. We too celebrated spring with the spring roll, thankful that the weather was so nice. Hey, it’s Canada and we had beautiful sunshine in early May! We felt so satisfied and Audrey is kind enough to give us some time to browse and get more goodies for ourselves before we headed out on our next adventure to one of my favorite places, Kensington Market. Audrey brings us to our next destination. Surprisingly, it is not a restaurant or bakery but a synagogue. She tells us that Russian Jewish immigrants lived and created Kensington Market. They sold food and this quickly became a popular place. Over the years, the reasonable rent and the want for real people selling fun and fair priced products lead to Kensington Market being a utopia for people from all over the world. Real restaurants with owners you can MEET. People who have a passion for food, culture and the city around them. 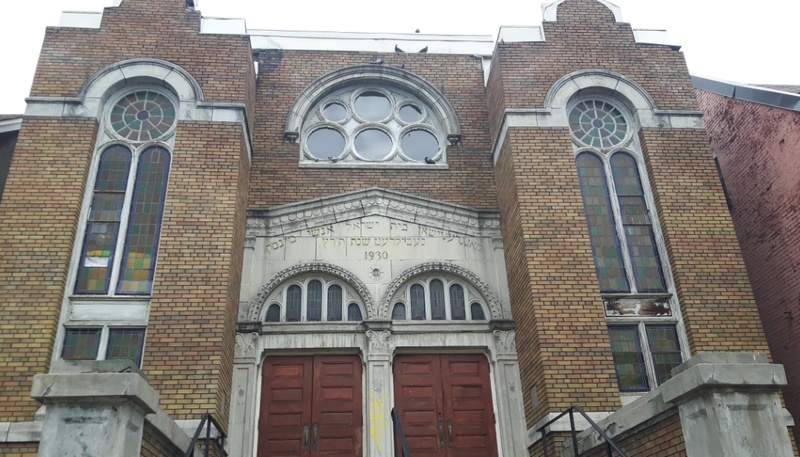 The beautiful synagogue was a reminder of how Kensington Market started and what it eventually will become. It was good food for thought as we headed to our next destination. We were ready to travel around the world in one afternoon! 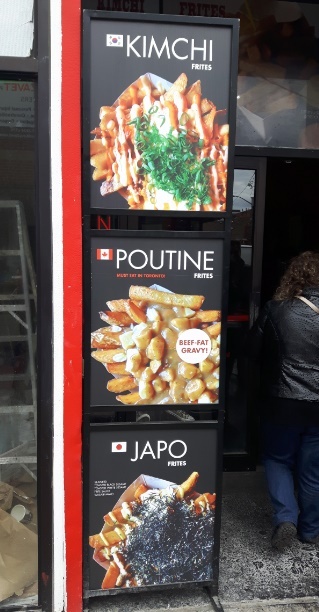 Many Canadians like poutine. Originating from Quebec, this French Canadian staple has become a Canada wide favorite! It’s one of our answers to comfort food, with a twist! We were excited to meet Ambrose, owner of Moo Frites, who is the father of this delicious take out. Ambrose did a solo backpacking trip through Europe and fell in love with the Belgian fries that he experienced. He told the group how Moo Frites was born. 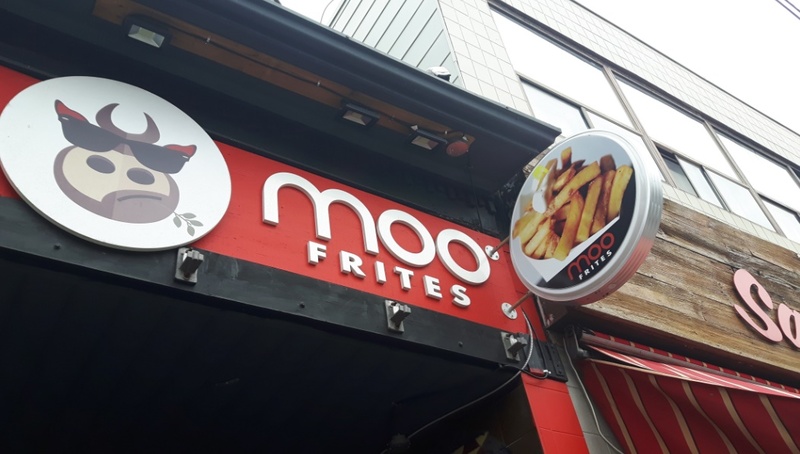 His creative flair, dedication to only the best potatoes and cooking methods for frites and more are the reason why Moo Frites is a local’s favorite. Ambrose also has custom designed fright boxes that even hold your gravy or side dips! We were curious about the peculiar sized holes that grace the bar styled seating in the restaurant. We quickly learned that it was Ambrose’s unique creative idea to put your fright box into the hole so you don’t have to hold your frites. Genius! Ambrose’s inspirations are multinational and his flavor creations and his ingredient mixes are truly unique in the world of poutine cuisine. He had a lot of signature dishes, like kimchi poutine. It really expands your mind and your palate! 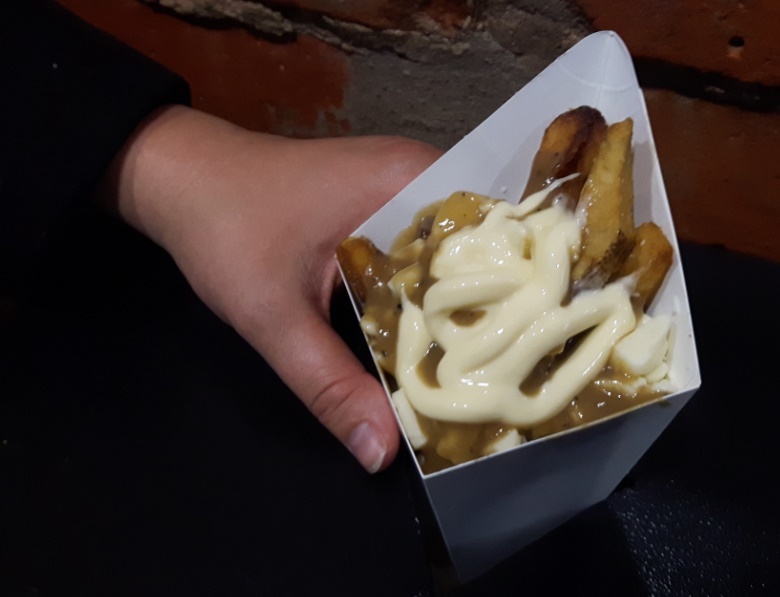 Our poutine was a beef gravy cheese curd poutine with mayo and maple drizzle. It was like Europe and Montreal had a baby and our group was in heaven! Audrey did not disappoint as she took us to the next destination. The group was so excited to go to The Popcorn Company. This delicious shop had every flavor imaginable. From watermelon popcorn to pizza , everyone tried different flavors we never knew existed. 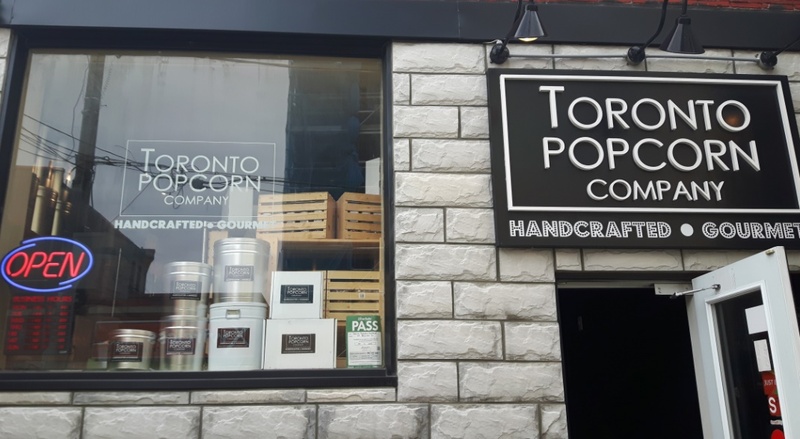 The Popcorn Company is sought out across Toronto and it challenges you to fall in love with these unique flavors. Watermelon Popcorn is everyone’s delight but we also tried garlic parmesan which was AMAZING. This makes a perfect gift for friends, is a perfect party gift and should be a staple for every holiday imaginable. 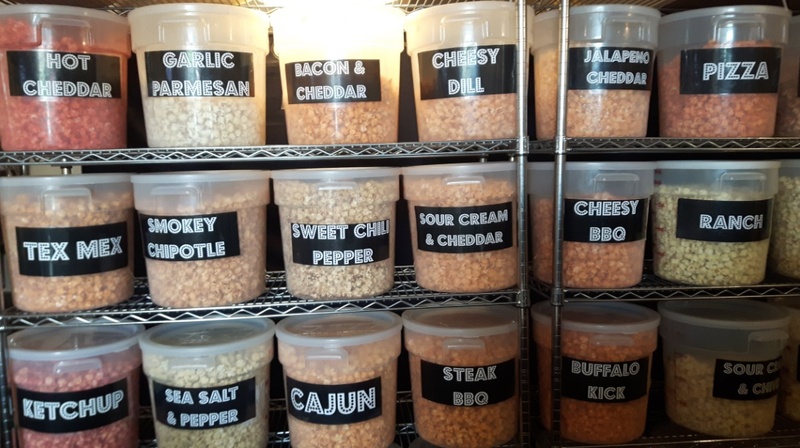 The Popcorn Company is kind enough to let you try samples of every popcorn! This is a must see in Toronto! 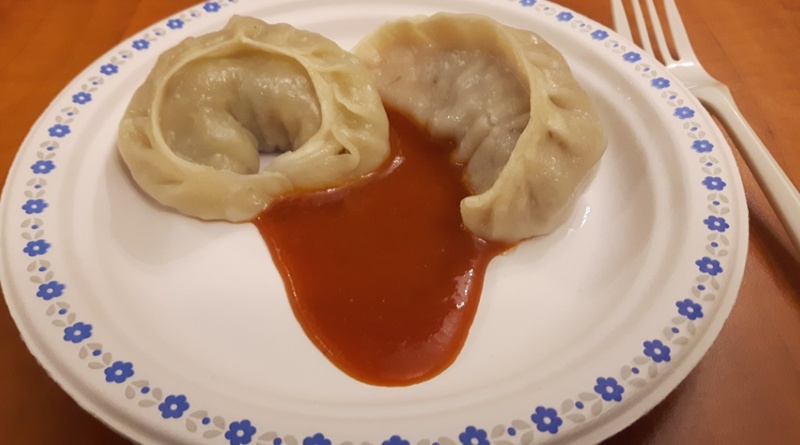 After we were satisfied with the best popcorn in Toronto, we moved on to The Tibet Café Smoothies Juice Bar to try two types of dumplings. 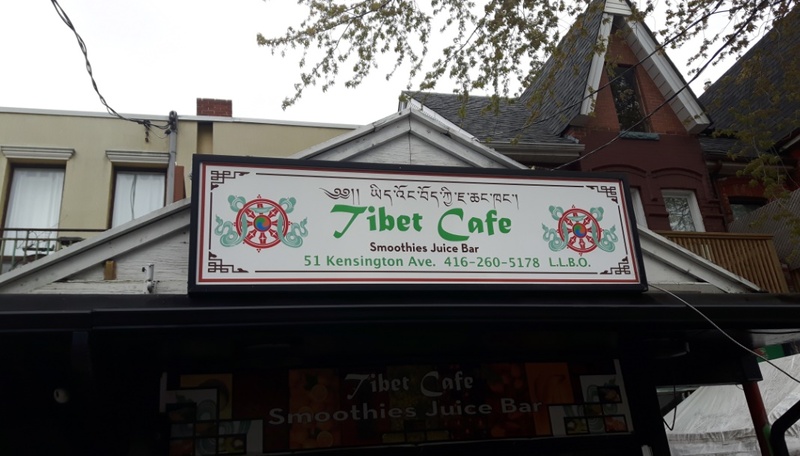 The vibe of The Tibet Café Smoothies Juice Bar is intimate and this family owned restaurant is a local favorite. When we tried the beef flavored dumplings we were impressed. They were the best we had ever had and we made the decision that we would come back to this restaurant again soon. What surprised us was how delicious the vegetarian dumplings were! They were delicious, full of flavor and had us wanting more and more. This is a hard choice but the vegetarian dumplings were our favorite. We would come here to fill up at The Tibet Café. The staff is friendly as this is a family run business and you will be treated so well from the moment you walk in to the time you leave. Bring your family for a yummy experience or go for a date with your partner or friends. The Tibet Café was not only delicious but a great way to unwind! 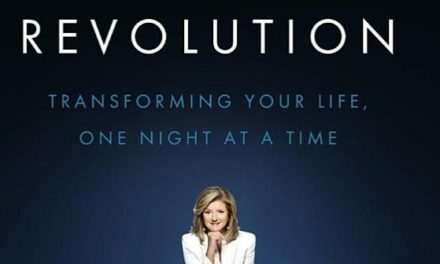 Go by yourself and bring a book. We felt full and relaxed. What a great combination. You would think that the tour would be over as we were spoiled with so many samples and meals, but it had only begun! We paid a quick homage to the Mona Lisa piece, we entered The Essence of Life Organics. We thought we were going into a small, quaint corner store but don’t be fooled! This store is BIG with endless goodies and rare items for you to have! This place is a guilty pleasure and it’s no wonder the locals love it so much. We went inside to sample maple syrup. There are currently four grades of maple syrup according to our wonderful tour guide Audrey. She explained that we have adhered to USA regulations as she poured us two types of syrup. We were excited to see what our German Tourist thought of our coveted syrup. She chose the lighter more sugary syrup as her favorite while the Canadians chose the darker syrup. We could all agree, both were delicious! We were given a few minutes to wander the store and make a few coveted purchases as this was unlike most stores at home. From rare soft drinks to delicious dates, this place is a shoppers dream. We will definitely be going back! 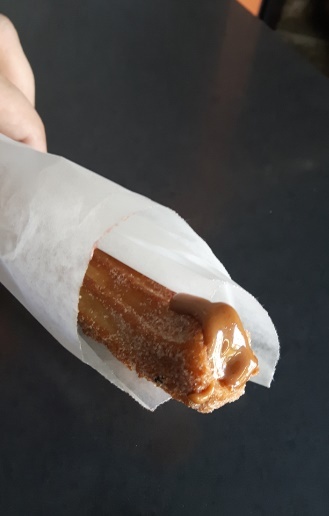 Have you ever had a Churro? It’s time to make our way to Pancho’s Bakery. Churros, Churros Churros! With an array of delicious flavors to choose from, we chose chocolate as our coveted snack. We watched this secret recipe made and in minutes our hot churro was in our hands! It was a bit of heaven as everyone gingerly feasted on this this coveted Mexican treat. 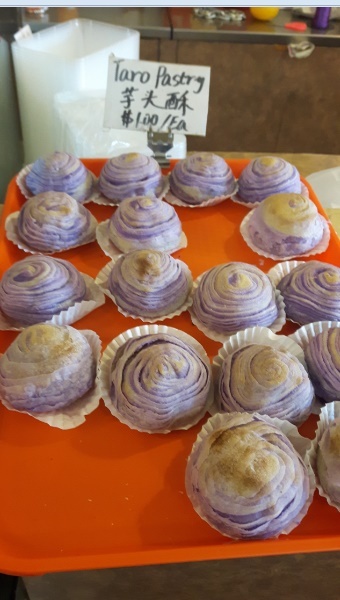 For a special treat that you will love, you have to head to Pancho’s Bakery. Impress the kids, friends and family with your newfound vast knowledge of the Churro. We walked to the Livelihood Café to have Arabic coffee and have our fortunes read. What was supposed to be a fun experience ended up being a powerful life changing one. 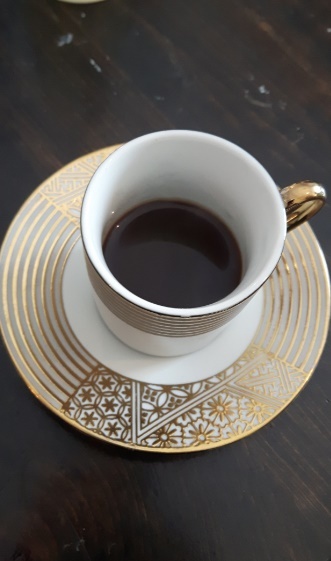 How can coffee and a few yummy Syrian treats change our lives? We were introduced to Jasmine, a kind and helpful hostess who shared with us that she was a Syrian refugee who would be reading our fortunes. 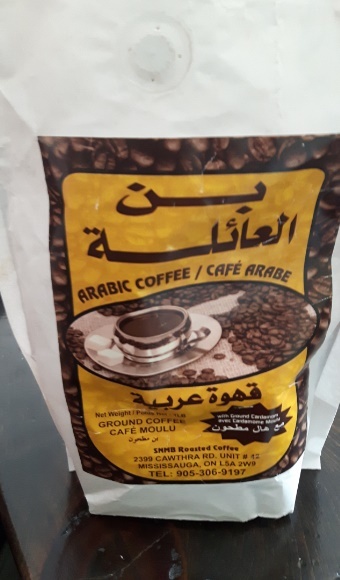 We learned how Syrian coffee is brewed (and it was strong!) 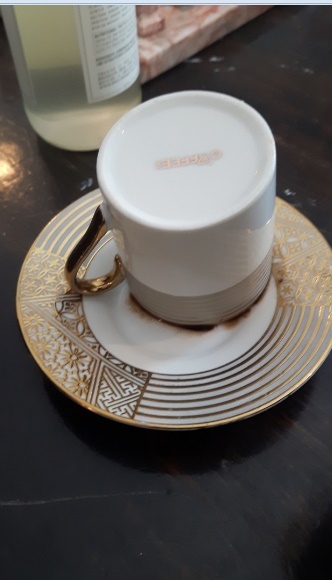 We were instructed after we drink it to turn our cups upside down on the saucer and to wait for the “mud” to seep down on the cup. When we flipped it back again, we were told to look for symbols. Some of the group saw mountains while others saw birds. 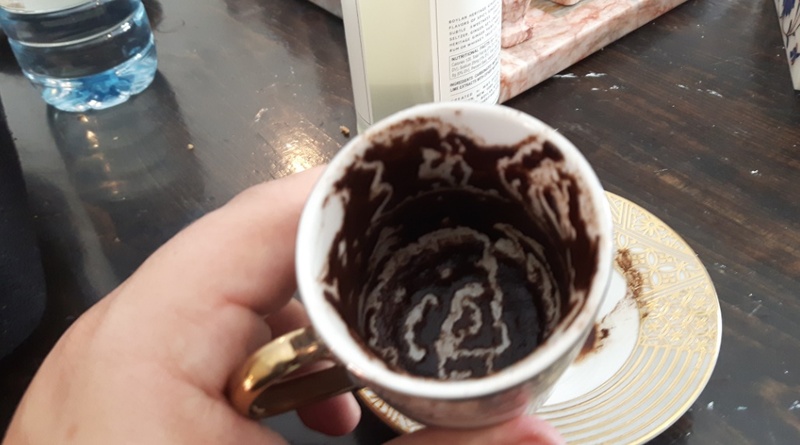 We saw a dragon in one of our group member’s cup. We learned what some of these symbols mean and we were told to take some time to see how it reflected to our lives. We smiled and Jasmine spoke up. Jasmine was a political activist when her brother helped her leave Syria to Lebanon. 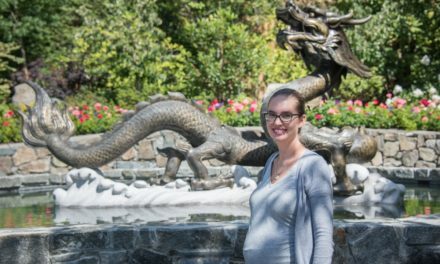 She traveled to a few countries before she was a refugee in Canada. As a result of helping her powerful sister escape, her brother was tortured for weeks and sub sequentially murdered. Jasmine bravely shared her story of coming to Canada as we choked back tears. She did not deserve this and we were touched from the selflessness, bravery and love her brother exhibited. We hope we could be half as strong if we were ever put in a similar situation. Jasmine and her coworkers introduced us to the Livelihood Project. It’s no secret that people who come to this country and those who are minorities face barriers to employment to build careers that are sustainable over time. Refugees need to learn skills that are resilient to change. From LGBT youth to refugees to other vulnerable groups of people are welcomed to interact in the café and community space with university students, free thinkers, conscious consumers and more. This is a safe space where the staff work hard to serve you and to sell you some delicious homemade products. You might come in for a coffee or a delicious cookie, but leave meeting some incredible people. 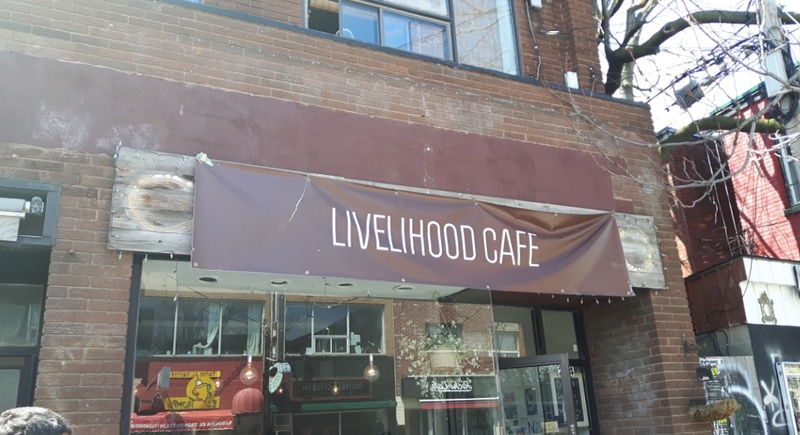 The livelihood project is Canada. to employment find pathways and options. There are also employability workshops and more. All and all, The Livelihood Project is the heart of Toronto. It simply wants a world where everyone has an opportunity to achieve economic self-sufficiency and has the opportunity to contribute to a broader community. 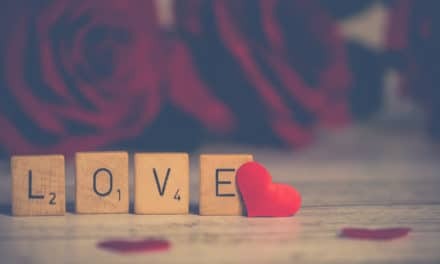 With love, acceptance, technology, information and positive interaction, this project is a MOVEMENT that everyone, visitors or locals would want to be a part of. Jasmine said good-bye to us and wrote each of our name in Arabic. It was fun to experience this and she took the time to pronounce our names in Arabic. She also wrote the group’s children’s name in Arabic too so those little ones waiting back home had something new to receive as well. What better way to end the sweet and savoury tour than with chocolate? We arrived at the Blue Banana Market which is a very busy place in Kensington Market! 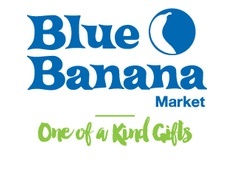 This is the go to place for unique gifts! You could spend hours browsing to find the perfect gift for family, friends or yourself. If you eat, breathe and sleep gifts, this is your heaven! WE love this place! We were excited to taste chocolate. We learned about some Canadian chocolatiers and tasted chocolate with a coffee bean in the middle (sweet and savoury) and chocolate with sea salt. Delicious and a perfect treat! Everyone wanted more and Audrey had then thanked us for being a part of this amazing tour. Could it be over already? We have to recommend this tour to EVERYONE. Audrey is a delight and one of the best tour guides we have experienced both in Canada and abroad. 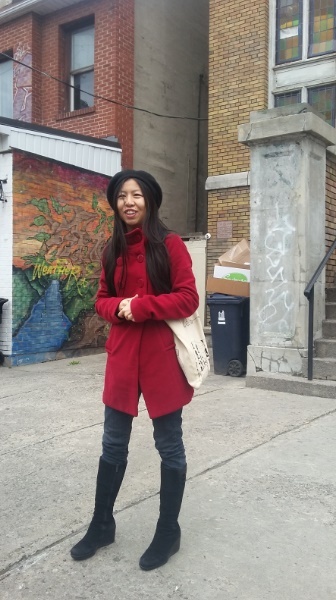 She is passionate about Kensington Market, full of useful information and takes a great interest in each guest. 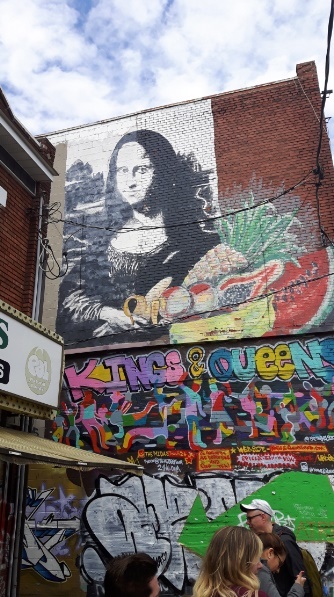 Whether you are a local or visiting from abroad, you become an expert in Kensington Market, one of the hippest and coolest communities in Canada. We love it there! The food is delicious. You get to meet owners, passionate locals and walk amongst a lot of free thinkers. Your children will love navigating the colourful/colorful streets of Kensington Market and filling up on tasty foods. If this is a date night, your partner and you will get to dine around the world in just one night! If you are going solo, you will definitely walk away meeting new friends. We sure did! IF you are going with friends, get ready for some laughter, a lot of insight and some great conversation. 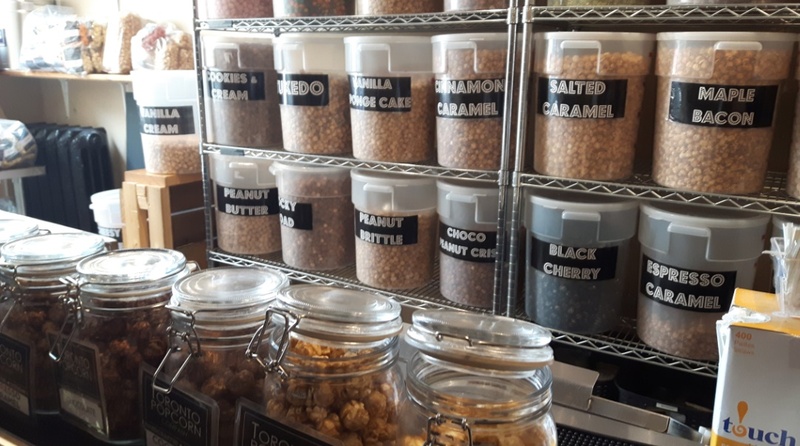 The Kensington Market Sweet and Savoury Tour by Tasty Tours is AMAZING. When you’re in Toronto, be sure to go on this tour, you must see the real Toronto, beyond our beautiful CN Tower. See the heart of Toronto. Come to Kensington Market.